Someone who was on a train in San Francisco saw another person hunched over an iPhone looking device. The person was hard at work and very concentrated on what he was doing. The onlooker, upon a closer look of the device, knew that it was an iPhone, but a model they hadn’t seen before. So as any curious citizen in today’s day and age would do, they pulled out their smartphone and snapped a pic. This pic was then sent to 9to5Mac from the tipster who also proceeded to say that the person holding the device was more than likely an Apple employee who was beta testing the new iPhone. 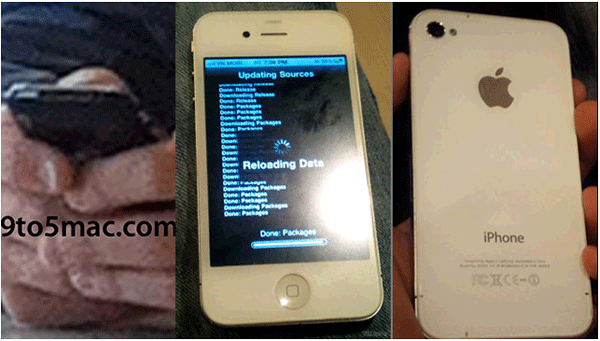 The two images on the right are believed to be the new iPhone 4s. That’s right, we are now talking about an iPhone 5 and an iPhone 4s that are both scheduled to hit the market in September. The difference with the rumored iPhone 4s is that it’s supposedly a cheaper model of the current iPhone 4. But the cheaper iPhone 4s won’t have the current glass front and back. Instead, the iPhone 4s will have a plastic back that will make the device substantially lighter than the current iPhone 4 model. The thing with both the iPhone 5 and the iPhone 4s is that both are now believed to be coming in September. This means we are talking about a dual iPhone model release, something that has never happened before in Apple’s golden history of the iPhone. What I’m wondering is, if we have two iPhone models being released at the same time, does this mean we can expect lines that are twice as long as before, double the excitement and double the iPhone sales? If all of the above is true, what I hope is that Apple has double the inventory. Because if not, there will be double the frustration!